Montpelier, Vermont (named after Montpellier, France), isn't just New England's smallest capital city—it's the tiniest capital in the entire country. But don't think for a moment it's not a worthy destination. Although Montpelier may feel like a small town (especially when state workers go home at night and leave the city to its 7,500 or so residents), it is centrally located in the midst of all of the attractions that make Vermont what it is. Ski slopes and maple sugaring operations, historic landmarks and cherished landscapes, and farm-fueled restaurants and independent retailers are all right here or nearby. Here's a roundup of Montpelier's best things to do. 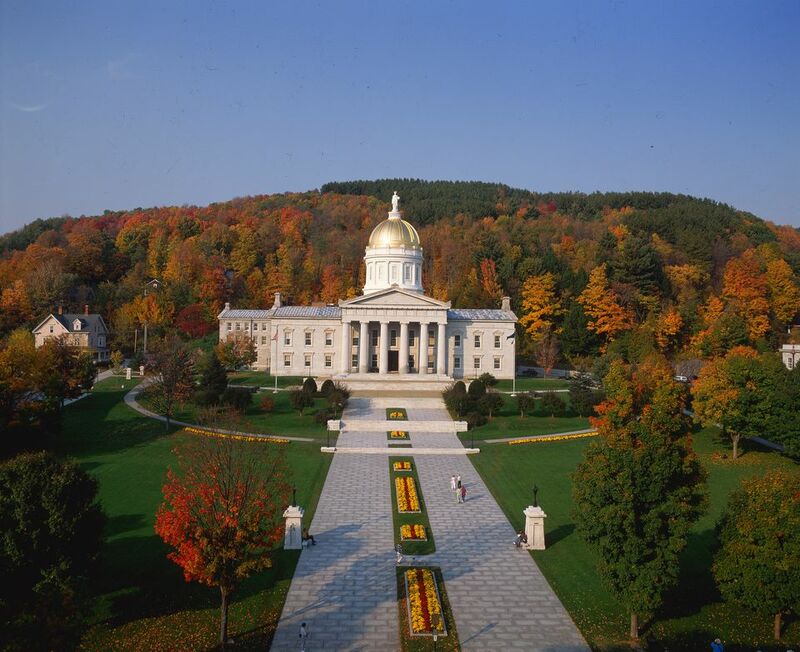 With its shiny gold dome and stately white columns, the nearly 160-year-old Vermont State House is a pretty focal point in the capital city. If you're like most visitors, you won't be able to resist the urge to get a peek inside. Tours are free year-round, and from July through mid-October, volunteers with the Friends of the Vermont State House are on-hand Monday through Saturday to guide you through the building and share stories of the decisions made here. You can also opt to explore at your own pace using a self-guided audio tour, available in four languages (English, French, Spanish, and German). This audio tour is also available to visitors Monday through Friday from mid-October through June. You're in for a treat when you visit Morse Farm Maple Sugar Works in Montpelier, a maple estate that has been owned by the same family for eight generations. The first Morses to settle in central Vermont learned to tap trees and boil sap from Native Americans. Now, their operation is open to the public year-round. Of course, spring is the best season to visit—that's when sap flows, and maple production is in high gear. But multimedia displays will help you understand the syrup-making process whenever you visit, and the shop is always open, so you can take home real, Vermont-crafted maple delights. A Vermont farm life museum and nature trail are also on-site. If there's one must-see in the Montpelier area, it is Rock of Ages, the world’s largest deep-hole dimension granite quarry. Less than a 20-minute drive from Montpelier in Barre, Vermont, this working quarry and monument factory is quite an operation to behold. From Memorial Day weekend through mid-October, buses leave the visitor center for the otherworldly site where enormous blocks of 400-million-year-old stone are harvested and hoisted. The factory, where these granite hunks are transformed into headstones and statuary, is open for self-guided tours from February through mid-December. You'll leave with a small, free sample of this distinctly Vermont product. Attention beer lovers, you don't have to race to all corners of the state to sample Vermont's most buzzed-about brews. At Three Penny Taproom in Montpelier, the chalkboard draft list is updated daily, and there are always nearly two dozen curated selections to savor, including beers made by renowned Vermont breweries like Hill Farmstead. The menu of affordable pub fare will make you want to order another and linger for a while. It's no secret Vermont is a leader on the farm-to-table dining scene, and you can support the next generation of innovative chefs by dining at two Montpelier restaurants that are part of the New England Culinary Institute's training program. Start your day or have lunch at La Brioche, a Parisian-style bakery and cafe where pastry and baking students learn the art of bread-making and confection creation. At NECI on Main, students and their instructors create eclectic dishes using a bounty of ingredients grown and produced in Vermont. Save room for dessert—you can sample six for just $9 Thursday through Saturday. Ben Cohen and Jerry Greenfield's entrepreneurial story is inspiring. A behind-the-scenes look inside an ice cream factory is fascinating. Free samples at the end of your tour are cold, creamy and delicious. And a walk through the Flavor Graveyard will make you giggle. That pretty much makes a trip to the Ben & Jerry's factory in Waterbury, Vermont, irresistible. This year-round attraction is a 17-minute drive from Montpelier, and while you may have a wait for your tour on the busiest summer weekends, the on-site Scoop Shop ensures you won't have to wait to get your hands on a cup or cone of your favorite flavor. If you want to go beyond the basic tour, book the Flavor Fanatic Experience and head into the Ben & Jerry's lab to formulate your own ice cream concoction. When you stay in Montpelier, you're a 20-minute drive from Vermont's premier apple cider producer: Cold Hollow Cider Mill. And if you don't think it's worth the trek to sip just-pressed cider, then consider this: Cold Hollow also makes its own line of alcoholic hard ciders, and samples are free. Watch the mill in operation daily in the fall or twice weekly other times of year as it extracts liquid deliciousness from apples grown near the shores of Lake Champlain. You'll drool even more when you watch the donut robots cranking out tender, hot cider donuts. The Cold Hollow Cider Mill shop has every cider-based gourmet treat you can imagine, plus a vast line of Vermont-made gifts to take home, and the Apple Core Luncheonette serves fresh, tasty breakfasts and lunches. For an aerial view of Vermont's charming little capital, head to city-owned, 194-acre Hubbard Park, where The Tower, built between 1915 and 1930, stands on the highest point of land. Climb the steps to the top of this 54-foot structure, and you'll spy the gold-domed State House and see just how much open space is preserved in this region. In the fall, you'll see surrounding mountains splashed with rich color. Hubbard Park also offers miles of trails to hike or snowshoe and seven fireplaces nestled in the woods, where you can build a campfire and cook your own toasty meal. With all of that maple goodness flowing out of trees and farm-fresh eggs and dairy products at chefs' disposal, it's easy to understand why breakfast is a favorite meal in Vermont. So, why settle for one breakfast each day? In Montpelier, you'll find all-day-breakfast restaurants like Down Home Kitchen with its from-scratch, Southern-inspired fare and the diner-style Wayside Restaurant, Bakery & Creamery where breakfast favorites are served until 9:30 p.m. The Skinny Pancake dishes out sweet and savory crepes morning, noon, and night. Drive 30 to 40 minutes in practically any direction from Montpelier, and you will bump into a ski mountain. Bolton Valley Resort—Vermont's night skiing and riding capital and an affordable, family-friendly destination—is closest to Montpelier. Winter fun awaits at nearby Northeast Slopes, too, which is a historic area that opened to skiers in 1936. Use the original rope tow for a nostalgic experience. More than 100 ski trails for all abilities beckon at Sugarbush, and while the resort is best known for its winter activities, it is now a year-round spot for outdoor recreation including downhill biking, golf, and hiking. In the fall, you'll love leaf peeping on a zipline or lift ride. Yes, Montpelier has its own petite winery. North Branch Vineyards is situated on the North Branch River, and its wines are made with grapes grown here and nearby. The tasting room is open Thursday through Sunday from April through December and by appointment during the winter. You'll get to try reds, whites, and even ice wine. Just two miles from downtown Montpelier, you can flee the developed world and explore fields and forests within the 28-acre North Branch Nature Center. Situated on the North Branch of the Winooski River, this environmental center's trails are open and free to the public and connect with neighboring trail systems. Birdwatching walks and presentations are hosted routinely, and the calendar of events also includes opportunities to learn about everything from nature photography to ghost orchards where heirloom apples survive. Lost Nation Theater is a stage company with a mission that goes beyond presenting evocative plays and musicals at Montpelier City Hall Arts Center. Theater's transformative and unifying powers are celebrated here, and when you buy tickets to one of more than 125 annual performances, you also support diverse educational initiatives. Each season features a variety of shows including new, often Vermont-inspired works and theater for kids by kids. Located on Main Street in Montpelier in a stately brick building with well trodden wood floors, 45-year-old Bear Pond Books has survived myriad threats to its existence. It's your place to pick up both new releases and quirky used books, to attend an author event, or to entertain your kids in the colorful upstairs Children's Room. Each summer, college players with Big League dreams take to the diamond at Montpelier Recreation Field, and you can cheer for the home team. The Vermont Mountaineers play in the 13-team New England Collegiate Baseball League (NECBL), and tickets for games in Montpelier are super affordable. The season runs from early June through the start of August.